Our equipment is considered some of the best in the industry. Our experience in moving towing, recovery and moving equipment has led us to make many improvements to our trucks and trailers to better serve you and your customers, both safely and efficiently. All equipment delivery trucks - whether our smallest or largest - have ground pickup and dropoff capabilities and are equipped with winches. All trucks are fully rigged and stocked to cover any emergency situation that may arise. All drivers are trained professionals in the industry. WreckMaster trained as well. 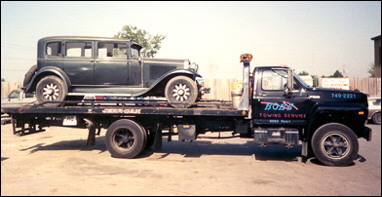 We can handle any type of automobile that needs to be moved. Our trained professional drivers will assure damage free loading with our state-of-the-art wheel lifts and tilt beds. Our drivers share the company commitment to friendly, professional customer service. They also respect your car like it was their own. We do motorcyles too! 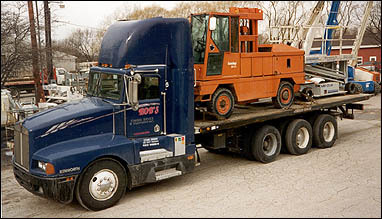 With our 12 or 20 ton wreckers we can handle anything from large work pick-ups, box trucks and dump trucks. Our medium duty tilt-beds are great for trucks and equipment that must be transported with the wheels off the ground. 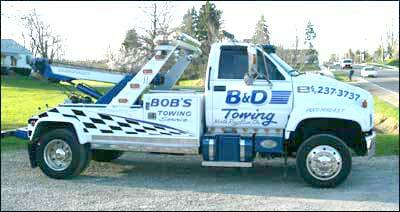 Our drivers are trained to remove axles or drive shafts to protect your equipment from damage while towing. Also, winching your stuck trucks is no problem. We can handle any heavy duty wrecker and recovery service for semi tractors, trailers, load shifts, roll overs, load transfers or busses. All breakdowns and accident scene is always responded to fast and professionally with our awesome state of the art 35 and 50 ton units. With our fully equipped trucks and WreckMaster trained employees we can handle almost any situations and get you up and going again fast. All of our versatile tilt beds are able to adjust to different dock heights for easy loading and unloading. Our 26 foot air ride tri-axel Kenworth can handle a payload of 17 tons, and can tilt for on-site dropoffs and pickups. All have heavy duty winches, which makes them ideal for transporting your construction equipment, lift-trucks, 20 foot containers, and small machinery. With these unique Landoll trailers, we can transport any heavy equipment or machinery locally or across the country. The true versatility of this workhorse trailer is its ability to completely raise to dock height. It can also tilt down to the ground to allow the equipment to be driven on and off without assistance. 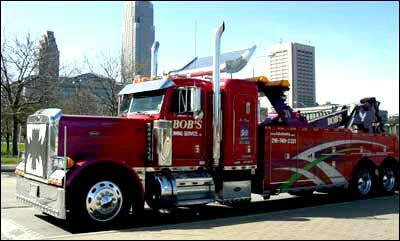 All of our semi trucks and trailers are equipped with air ride suspensions for a smooth ride. Call us today for your special needs.